‘View our short video on advertising and learn how it can make a difference to local businesses’. Focus Magazine Group is an established independent publisher bringing local businesses and communities closer together. 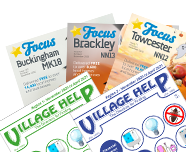 Successfully trading for over ten years our seven Magazines are delivered free to over 64,000 homes and businesses within the NN12, NN13, NN7, MK11, MK18, MK19 OX26, OX27 post code areas. Our philosophy is simple, we produce interesting, informative, colourful, and eye-catching A5 size magazines, with general articles, business reviews and competitions for readers - combined with advertisements from all trades, businesses and companies locally which we deliver free of charge to homes and small businesses within our distribution areas of South Northants such as Towcester NN12, Brackley NN13, Midshires NN7. Oxfordshire, Bicester OX26/7, Stony Stratford MK11/19 and Buckingham MK18 Bucks post codes. All delivery areas are close to Oxford, Banbury Milton Keynes & Aylesbury. This affordable creative advertising is a solution for all trades to promote and advertise their products and services to the local area in a very cost effective way. Look no further than to the left of this page for the very latest information or on the News & Events tab for absolutely everything! If you are organising a local Community or Charitable event, please get in touch and we'll do our very best to include it in our magazines too. And finally, if you like the look of this website and would like one for your business, why not contact us for an informal chat on 01327 353753 about your website requirements. Sunday 26th May 2019 10am to 4pm.